I used to think that if you're getting a comic book on Free Comic Book Day what's the point of reviewing it? The whole point of reviewing is to lend some perspective on a new issue you're thinking of plunking down some hard-earned money for. If you're getting it for free then where's the risk? Then, Image Comics sent me copies of 'I Hate Image' and 'Kid Savage' and Free Comic Book Day will never be the same again. It turns out what Image is offering is substantial and all for the price of zero! Especially, 'Kid Savage' by Joe Kelly and Ilya, with a lengthy excerpt from the graphic novel. 'I Hate Image' by the one and only Skottie Young is a delightfully madcap adventure that viciously spoofs Image Comics. 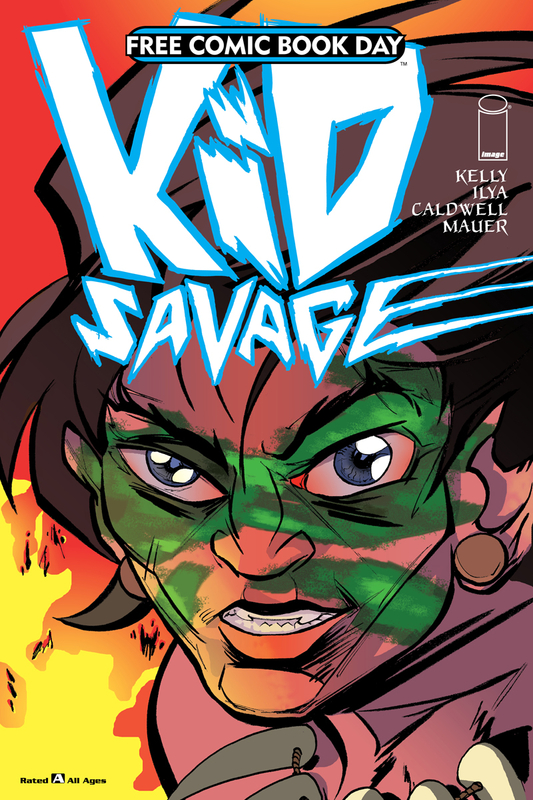 You could pay for these and it would be totally worth it (highly suggest getting the entire 'Kid Savage' graphic novel). The fact that they're being offered for free is a steal. Two great reads for two entirely different audiences that are a complete blast. Normally, I'd say these are must-buys but since they're free they're must-haves! Get to your shop early so you don't miss out. 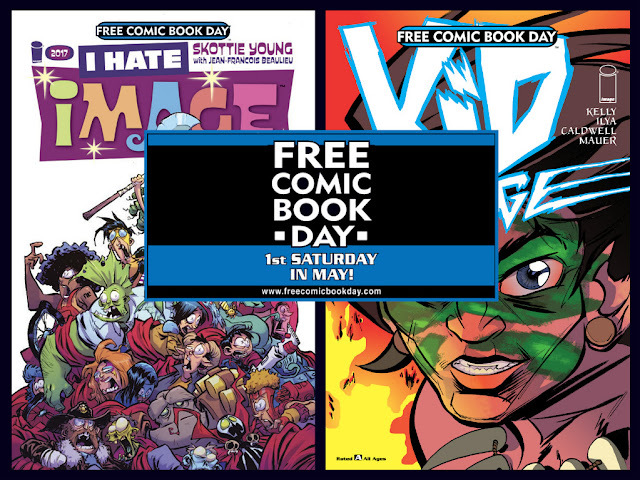 So while all the books being offered on Free Comic Book Day are worth your time please buy something else while you're at your local comic shop as they pay for these FCBD books and they could use your support. Happy reading! 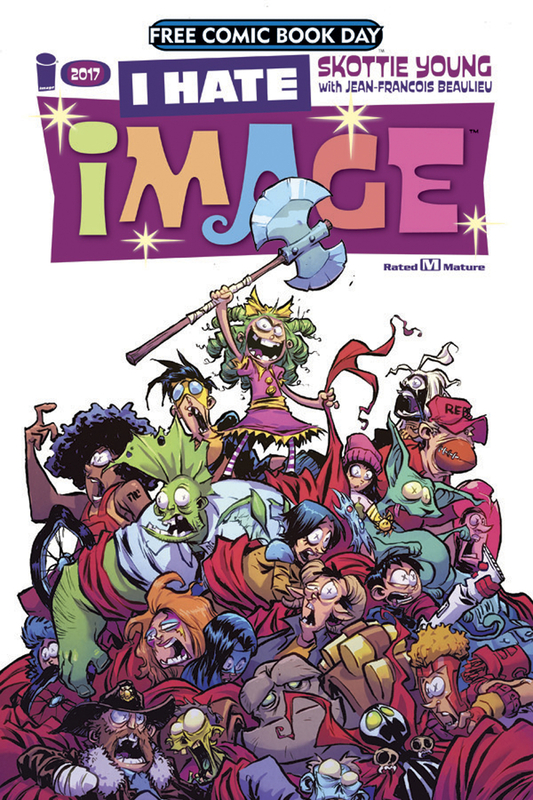 Review: This hilariously brutal one-shot takes our favorite pig-tailed axe-wielding Gertrude through the world of Image Comics. She's in search of a way out of Fairyland and finds herself encountering Image's most popular characters from Spawn, Saga, The Walking Dead, East of West, and much more cameos. It's one giant spoof and totally irresistible. As always, Young's uniquely wild cartoon style art and Beaulieu's bright colors make this a gorgeous collector's item full of easter eggs. Review: This fast-paced, bright, bold, and larger-than-life adventure lives up to writer Joe Kelly's inspirations of Lost in Space and Hanna-Barbera's The Herculoids, to name just a couple. It may be an All-Ages but it's sometimes poetic, sometimes poignant, but it's all one big great adventure featuring a dysfunctional family of explorers who crash-land on a strange planet and have to depend on a local native in order to survive. Artist Ilya provides some epic, sweeping, visuals that propel some ambitious chase scenes. It's a rewarding read for all ages that blends action, thrills, humor, warmth, and heart. 'Kid Savage' starts slowly and just keeps picking up speed into one amazing ride.